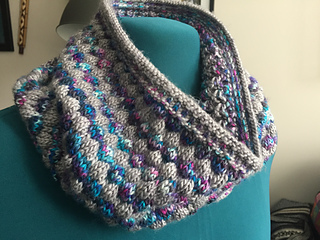 This pattern was designed to create a thick plush fabric reminiscent of bubble wrap using two colours of highly variegated single ply worsted weight hand painted yarns. loose cowl is 36 inches around and 10 inches high when blocked and 28 inches around and 10 inches high when unblocked. The less intensely your item is blocked the puffier your bubbles will be and denser and more plush the fabric will feel.